Got your iPhone? Your Mac? Your iPad, Apple TV, and Apple Watch? Well, now the tech company wants you to have an Apple credit card, too. 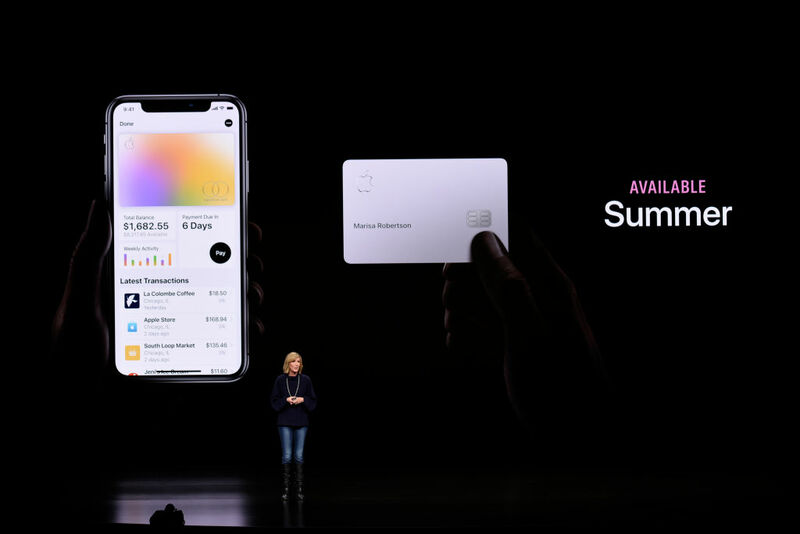 The Apple Card was announced during an event on March 25th, but it won’t be available until summer 2019. Still, if you’re into all things Apple—or are just looking for an alternative to your standard, bank-issued credit card—we talked with some experts about what makes the Apple Card unique. Even if you’re a person who prefers not to pay for things with credit, credit cards have their advantages. And if you’re already using Apple Pay, which allows you to pay for purchases with the tap of your iPhone (after you link your credit and debit accounts to it), the Apple Card might feel like the next logical step for you. So what’s the deal with Apple Card? First of all, Apple partnered with Goldman Sachs as its banking partner, and at an event announcing the card’s launch, Goldman Sachs CEO David Solomon said, “Apple Card completely changes the credit card experience and is built to help customers lead a healthier financial life,” per CNBC. Sounds good, right? But is the Apple Card really different from other credit cards? And how will it help people have a “healthier financial life”? HelloGiggles got the scoop on the new Apple Card from three experts in the world of credit and finance: Kassandra Dasent, a certified financial education instructor and personal finance consultant; Monica Eaton-Cardone, the co-founder and COO of Chargebacks911; and Daniel Gillaspia, founder of the credit card rewards blog UponArriving. Here’s what they had to say about the product to help you figure out if you want to take the Apple Card plunge this summer. What is the Apple Card and how does it work? Gillaspia: The new Apple Card is a consumer credit card designed by Apple that runs on the Mastercard payment network and is issued by Goldman Sachs. You can apply for it through the Wallet app and it can be used (immediately) with Apple Pay on your iPhone with no physical card. Also, customers will be able to use a physical card (made of titanium) where Mastercard is accepted. It emphasizes simplicity and security in a way that other cards don’t. What are the key differences between the Apple Card and other credit cards? Eaton-Cardone: The primary difference is that there’s no need to use a physical card. While consumers can still use a physical card at brick-and-mortar locations, the platform is integrated into the Apple Pay mobile wallet tool and designed to work as part of that environment. The Apple Card also features a few unique security advantages. For example, the fact the card exists within the Apple Pay environment means there’s no physical card number. This makes it more difficult to steal. Plus, the inclusion of a dynamic security code, similar to the “Motion Code” technology introduced by Oberthur Technologies a few years ago, can help further mitigate risk. Dasent: iPhone users will be able to apply for the Apple Card using the Wallet app, be approved within minutes, and can immediately start using the card with Apple Pay. Apple Card has positioned itself as a no-fee card, which includes no annual, late, or over-limit fees, as well as zero foreign transaction fees. From a visual and security perspective, the Apple Card stands out. In addition to Apple’s commitment to enhanced security for purchases made using an iPhone, a cardholder will only see their name laser-etched on the face of the physical titanium card. How important are the added privacy and security features provided by Apple Card? Dasent: Given that identity theft is a prevalent concern, the Apple Card positions itself as a strong deterrent. The physical card will not include any numbers, such as expiration date, card number, or a CVV, but is available on the customer’s iPhone. In the event the physical Apple Card is stolen, there is no ability to make fraudulent charges. Where Apple emphasizes its commitment to enhanced privacy and security is through the iPhone itself. Once approved for an Apple Card, the customer is issued a unique device number and kept locked. Each purchase made will require both the device number and a one-time use security code. Every purchase must be authorized by the customer either using Face ID or Touch ID. This process ensures that Apple itself is not able to track the where and what that was purchased, or how much a customer paid. However, it is still the customer’s responsibility to secure their device with a strong and unique password to thwart other ways of compromising sensitive data. Eaton-Cardone: In some ways, it’s a great step forward for online security. As Apple Card is integrated into Apple Pay technology, consumers have the benefits of using the same tokenization technology employed by EMV chip [aka smart chip] cards. The tool also employs two-factor authentication: the user must unlock the device and provide a secondary form of ID, like a fingerprint scan, to authorize a payment. Of course, no tool is perfect. For example, a dynamic code won’t matter unless merchants put emphasis on collecting the cardholder’s CVV at checkout. How does the Apple Card’s “Daily Cash” compare to cash back from other cards? Dasent: As with reward cards offered by traditional institutions, customers will receive a specified percentage of Apple Card purchases referred to as Daily Cash. Where it differs to the rest of the industry where cash-back rewards are paid out monthly, Daily Cash is added to the customer’s Apple Card each day. Customers can immediately use the funds for purchases via Apple Pay, send cash to someone via Messages, or apply it towards their Apple Card balance owed. Gillaspia: The new Apple Card isn’t the best cash-back card, but it does offer some unique perks. The 2% cash back is nice, but it’s only on Apple Pay purchases, and there are some cards (with no annual fee) that earn 2% back on all purchases, so it’s not exactly industry-leading. The instant cash back is a unique perk, though, and it’s also nice to see so many fees removed from the card. What are the benefits of having a credit card through a traditional bank over Apple? Dasent: What most traditional banks offer with their credit cards that Apple Card has yet to mention are sign-up bonus rewards and additional perks, such as extended warranty and purchase protections and trip cancellation insurance. The other main point of consideration is that Apple Card is only accessible to those who own an iPhone. Gillaspia: Traditional banks have more options to choose from and many have ways to transfer points out to travel partners. So whether you’re trying to maximize cash back or points for travel, sticking with issuers like Chase, Amex, Citi, etc. are going to present you with a wider selection of lucrative earning opportunities. Eaton-Cardone: Consumers may be turned away by the lack of physical bank locations. While physical outlets grow less and less important with time, many consumers still appreciate the convenience of a local branch office. Also, some consumers may be unable to completely transition to a new bank due to existing financial obligations. Mortgages and auto or personal loans can tie individuals to a bank in some situations. What benefits do Apple’s partnerships with Goldman Sachs and Mastercard provide? Eaton-Cardone: Seeing Goldman Sachs and Mastercard attached to the Apple Card brand offers a few benefits. The first is legitimacy—consumers and businesses know these brands within the finance and payments sectors, and seeing them attach themselves to this project builds confidence. Also, more parties involved here mean more consistency. It’s especially promising to see Mastercard back this initiative; I’ve been an advocate for more consistent standards in the payments industry for years, and collaboration between these companies could be a positive step forward, even outside the Apple Card brand. Dasent: Although a new player in the consumer financial services sector, Goldman Sachs has promised that it will not share or sell Apple Card customers’ data to third parties for marketing purposes. By partnering with Mastercard, it allows Apple Card customers access to stores and merchants virtually anywhere in the world and use of a payment-processing platform that is widely trusted. Gillaspia: I really like that Apple/Goldman Sachs are committed to not sharing or selling data to third-party companies, which is a notable departure from other banks. What do you think of how Apple Card will calculate interest? Dasent: As with all credit cards, the Apple Card has a high interest rate. But where it differs is the wider variable range of the annual percentage rate (APR), between 13.24% and 24.24% based on “creditworthiness.” This makes the Apple Card potentially accessible to a larger segment of the population. Those who have a high credit score will benefit from a considerably lower-than-the-national-average interest rate. On the other end of the spectrum, the higher APR will affect people with a less-than-stellar credit history. The main issue is whether an Apple Card customer will carry a balance from month to month. For those that will, any cash back earned may be negated by the money paid as a result of a higher interest rate. Traditional institutions typically offer their best rates to customers with an excellent credit rating who pay their statements in full every month. Apple will do the same. The Apple Card claims it will “help customers lead a healthier financial life.” In what ways does its design help with managing finances? Dasent: What Apple Card offers is the technology to sort and categorize customers’ purchases. It makes it easy for them to modify the registered business name of the store where purchases were made and view how much is being spent on items such as food or clothing. In addition, Apple Card will provide an at-a-glance spending summary on both a weekly and monthly basis. An added bonus which can encourage customers to pay off credit card debt more quickly is that Apple Card will offer several payment options, the ability to schedule frequent payments, and simulate the interest cost on different payment amounts. However, for those who struggle with credit card debt and overconsumption, the ease and simplicity of an Apple Card may entice some to continue with unhealthy spending patterns and habits. Do you see any downsides to a tech company like Apple offering a credit card? Gillaspia: Apparently, transaction data will be kept with Goldman Sachs and not available to Apple, so I’m not initially worried about too much data being in the hands of a tech company, but you never really know. I think I’m more excited to see a tech company playing a more integral role in the development of a credit card, since typically a brand’s name is just stamped on a co-branded credit card. While I wouldn’t exactly call anything Apple has done here truly revolutionary, it makes me excited to think about innovation that might occur down the road and what other tech players might get in on the action. What are things that consumers interested in the Apple Card should know before signing up? Dasent: Note that the Apple Card will be made available to U.S. consumers starting this summer. It is advisable to wait until Apple releases further information on interest rates, how it will treat cash advances, and who will qualify before applying. Based on the information we have so far, would you recommend the Apple Card? Dasent: For those who are fans of Apple and its product offerings, the simplicity, integration, and appeal of the Apple Card will likely win them over, even if consumers may benefit from select higher cash-back rates with traditional banks. Gillaspia: Overall, it’s an interesting product with distinguishing features and great for heavy Apple Pay users, but it’s not a card I’d be drawn to for unparalleled value.